Thousands of miles traveled. Dozens of cities visited. Hundreds—even thousands—of messages given. I’m not giving the itinerary of a modern politician or celebrity; rather, I’m describing in brief the career of the Apostle Paul. Paul reached most of the Mediterranean world in his day, but imagine what would have happened if the Apostle had been able to speak to people living at the very ends of the earth in his lifetime? As in the early church, Christians today demonstrate remarkable zeal for spreading the gospel of Christ. Yet not everyone can go to the ends of the earth. 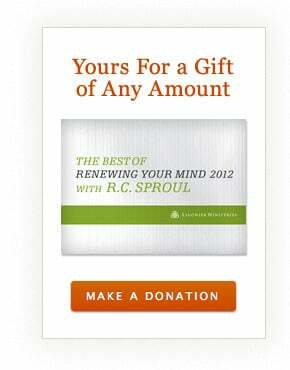 This is why Renewing Your Mind (RYM) is so important. It has been at the vanguard of our global teaching ministry at Ligonier. We steward $3 million dollars of donor-given money per year to reach a potential listening audience of more than 100 million people. Dollar for dollar, it’s still our most effective and efficient outreach. Our board will be meeting in early May to assess our radio outreach budget and we need the support of friends like you. Through donating via our secure website you can help sustain and expand RYM’s reach. To thank you for your support, when you give your gift of any amount we will send you a special CD The Best of RYM 2012. This CD features three messages that have been selected for their depth of content and timeliness, providing you with a resource to enhance your learning and witness. We are excited about a new opportunity to expand our ministry into Southeast Asia in a significant way. Through a partnership with the Far East Broadcasting Company, we now have the unprecedented opportunity to get RYM and Ligonier teaching to listeners in Vietnam, Cambodia, India, Indonesia, and many other hard-to-reach places via the distribution of microchips they can use to load content onto their cell phones and other portable devices. By God’s grace, we can expand RYM’s reach throughout Asia and sustain our overall radio outreach. Will you help us do so this spring? Thank you. Note: Offer expires 04/30/13. Please allow up to 6 weeks for delivery after your gift is processed. Contributions are tax-deductible as allowed by law. For federal income tax purposes, the deductible portion of your charitable contribution is limited to the excess of the money contributed over the value of the goods provided. Our good faith estimate of the value of this resource is $5. Offer valid in U.S. and Canada only. Thank you for your support.